Large, 2" cup-shaped blooms of neon pink with a white edge will appear for weeks in the summer, foliage turns red in fall, an unfussy variety that is easy to grow and drought tolerant. 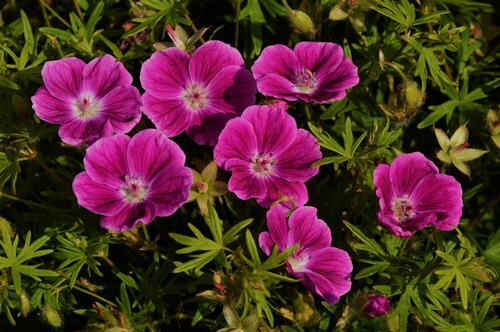 Hardy geraniums are long blooming and adaptable to a wide range of growing conditions. Some have ornamental foliage for additional appeal. Most bloom heavily in late spring to early summer and then periodically throughout the summer. They are easy to grow and maintenance free. Plant in well-drained soil.